This 6,488 meters long, par 72 course is set in the heart of a 2,000 acre golf and leisure complex. The course was designed by American golf course architect William Mitchell and has hosted the Portuguese Open seven times. The course is dotted with huge pines and lakes, and the fairways and greens are renowned throughout Europe for their standards of condition and care. Many of the tees, greens and fairways have varying elevations that require shotmaking from an assortment of lies. Named after and in celebration of the adjacent Nature Reserve, this course is also situated in the 2,000 acre golf complex with its sister course. Apart from the par 3's, nearly every hole has some form of dogleg, some quite severe, others just hinting at a curve. What all holes have in common is that they demand accuracy from the drives to achieve the best results from the second shots. The majestic umbrella pines impede many a shot throughout this scenic course. Built in 1969 to a design by Frank Pennink, this is a classic of course design. The course has hosted the Portuguese Open as well as many other major European tournaments. Seve Ballesteros, Ian Woosnam and Padraig Harrington are but a few of the touring professionals that have enjoyed the course at it's superb best with narrow tee shots under umbrella pines. The course contains some of the most spectacular views of the sea, and the narrow tree lined fairways are memorable. This is the first course in Portugal to be designed by the English Golf architect Donald Steel. Opened in 1991, it quickly gained international fame by hosting the Portuguese Open of the next two years. Vila Sol is a typical inland course with British characteristics and is a test of the golfer's strategic skills, with lakes and bunkers, not to mention fast greens. Water hazards are a strong feature on both the front and back nine, and umbrella pine trees follow the tightened fairways. Originally designed by Sir Henry Cotton and containing the famous seventh hole, 'Rocky' Roquemore subsequently elaborated the original plans and laid out a wonderful test of golf. Regular visitors to "The Valley of the Wolf" will find that the Royal Golf Course an extremely demanding course. Vale do Lobe features one of the most photographed holes in the world - a par 3 which demands a 218-metre carry across three spectacular cliffs to reach the green. The greens and fairways contain severe undulations, but the views of the neighboring sea are spectacular. As its name implies, the Ocean Course provides attractive links-style holes adjacent to the Atlantic. There are parkland holes, too, meandering through the Vale do Lobe estate. The course contains lakes, dramatic doglegs and fast tiered greens. 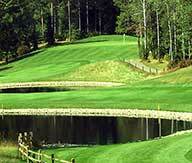 The combination provides a challenging course for golfers of all handicaps. Set in the spectacular Ria Formosa Nature Reserve, Golf World currently ranks it the number 2 golf destination in continental Europe. It enjoys an international reputation and is ranked alongside Valderrama in Europe's premier league of golf. This championship course, set among the pines, offers wonderful views over the Atlantic Ocean. Although the sheer magnificence of the setting can cause some confusion, the course is 'user friendly' and it is consistently maintained at an excellent standard.